This may be the least prepared for anything that I have ever been but I was idly hanging out on Twitter a few minutes ago and my timeline went wild with sign-ups and introductions and I figured that I would be a tag-along and join in too. Completely on a whim. As it happens, we’re recovering from arriving back home yesterday from the US, haven’t any plans for today and it’s a miserable day. What better way to spend that day than with a read-a-thon?! None. Plus, Boyfriend got a new game for his PS3 yesterday so I’m not envisaging much out of him for the next couple of hours. I will get stuck into some reading today and will read this evening but almost certainly won’t be pushing on into the wee hours because we’re going out for lunch tomorrow with Boyfriend’s parents and I don’t really need to do that with a read-a-thon hangover. I’m not a good person when tired. STILL, I still have a good…ten hours before I’ll start getting sleepy. Let’s do this! West Yorkshire, England. It’s gloomy, wet and perfect for reading a ton. I haven’t really made a plan or stack or anything at all but I’m just about to start Bellman and Black by Dianne Setterfield and I’ve been looking forward to that for ages. I *loved* The Thirteenth Tale so I’m hoping for more gothic goodness. We’ve just got back from holiday so we don’t exactly have a great volume of food in but I do have some blackberries that we picked before we went and are defrosting right now so let’s say those. Or maybe I’ll brave the rain for a snack run later. Probably not though. Come on blackberries! I’m 27, live in a village in West Yorkshire with my boyfriend and am a solicitor in “real life”. I am terrified of cows and dogs and just quite scared of pigeons. I am a massive food geek and would cook and eat all day, every day if I could without jeapordising my health. I run to compensate for being a massive food geek. I’ve done other read-a-thons before but never this one. 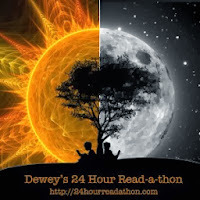 I’ve always had Dewey read-a-thon envy because it looks like one of the most sociable so I’m looking forward to reading some great books, making the most of it being bleak and having an excuse not to be doing anything and tweeting about it as @LitAddictedBrit.